Connie Diamond has always been her husband Jimmy’s ‘best girl’ – or so she thought. But then she discovers that he’s been playing away for the past twenty-four years, and that the chocolates she believed he bought her as a sign of his love were just a cover-up, and she is determined to get revenge. Along with Della Frostick, Jimmy’s right-hand woman at his cleaning firm, Diamond Shine, Connie decides to destroy Jimmy’s life from the inside. Together they will set up a rival business called Lady Muck, and along with the cleaning ladies who meet at the Sunflower Café, they’ll make him wish he had never so much as looked at another woman. Then Connie meets the charming Brandon Locke, a master chocolatier, whose kind chocolate-brown eyes start to melt her soul. 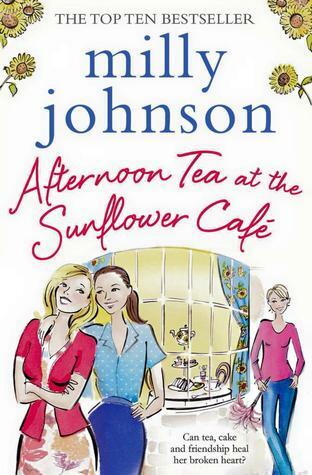 Can the ladies of the Sunflower Café help Connie scrub away the hurt? And can Brandon cure her affliction and make her smile again…? 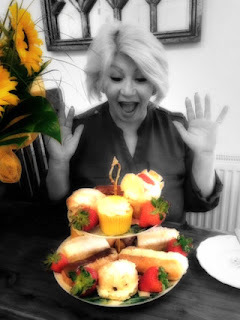 It’s no secret on this blog that I’m a big fan of Milly’s books, they always make me smile (and sometimes cry) but they are always such fun to read, and Afternoon Tea at the Sunflower Café is no exception. Unlike the previous book, The Teashop on the Corner, the Sunflower Café doesn’t play a huge part in the story, but its still an integral feature, as this is where the Diamond Shine girls have their meetings. There are two main themes running through this book, revenge and friendship. When Connie Diamond discovers that her husband Jimmy has been cheating on her yet again and is planning to leave her, she hatches her own plot to get even. Does she cut up his clothes, damage his car – oh no, she sets up a rival cleaning business in the hope of destroying his. As usual, Milly has created some fabulous characters, from the likeable to the bizzare! There were one or two that I took a little longer to warm to, for example Della. Della is Jimmy’s office manager and there is nothing that goes on at Diamond Shine that she doesn’t know about…or so she thinks. She has secretly been in love with Jimmy for years and is devastated by the turn of events. She is torn between getting revenge and wanting to protect him. Connie, Jimmy’s long suffering wife, was the real star of the book for me and perfect proof that some women won’t just sit back and be a victim. I was rooting for her all the way and hoping that Jimmy would get his just desserts. There are many other characters who played their part to perfection – there are too many to mention individually – some were odious and others engaging, but they were all brilliantly drawn and realistic. Among the cleaners, Cheryl was my favourite. She was kind and loyal but also had her share of misfortune and put up for too long with other people wiping their feet on her. I had a soft spot for Astrid, an outspoken German who took Cheryl under her wing; and then there is Ivanka. Ivanka was the office junior and the cause of so much heartache, I should have disliked her, but her manipulative manner and lack of charm did make for many amusing moments. There is so much to love about this story, it is funny but also heart-warming and written, as usual, in Milly’s forthright and down to earth manner. It was wonderful to see characters grow in confidence and be helped by each other. Having seen Milly read from this book at the Books and the City Bloggers event a few months ago, it did bring the book to life for me and I could easily imagine Milly’s voice behind some of the characters. I couldn’t finish this review without mentioning the chocolate. If you are on a diet then you may have a hard time reading this book because the chocolates sound delicious and are to die for. It is quite a big book, over 500 pages but every page is pleasure to read, there are laughs, some sad moments and little twists and turns. I loved it and I’m sure it will be another huge success for Milly Johnson. My thanks to #Team Milly at Simon & Schuster for the paperback copy. Milly Johnson is a Sunday Times top ten bestselling author. Her novels are about the universal issues of friendship, family, betrayal, babies, rather nice food and a little bit of that magic in life that sometimes visits the unsuspecting. Afternoon Tea at the Sunflower Cafe is her eleventh book. Find out more at www.millyjohnson.com or follow her on Twitter @millyjohnson.